If you won the lottery, how much would you spend on an entertainment room? 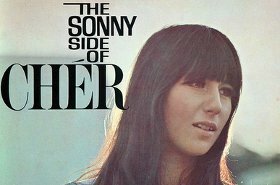 Probably less than music producer Jeremy Kipnis. 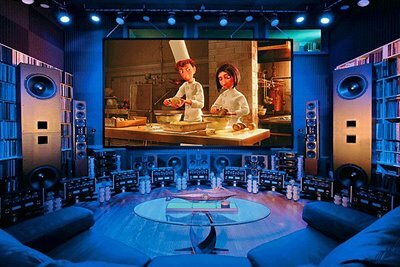 He has put a cool $6 million into his “home theater”. 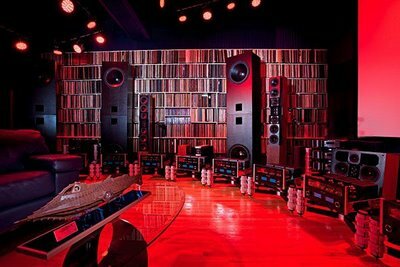 The home theater, which he calls “Kipnis’ outer limits theater”, is an 8.8 channel channel audio system (although there are a lot more speaker than that) and delivers a frequency response of 10Hz to 100 kHz. The amplifiers are a combo of audiophile tube and solid state technology, and can deliver a mind-blowing 11,000 watts of power into audio geek level speakers. The room is 33 feet long, 26.5 feet wide and goes from 8 feet high in the back to an 18 foot high screen at the other screen end of the room. Of course even the power conditioners is top-notch (13,800 volt step-down transformers), and even all the cabling is super high end, right to the cryogenically-treated breakers. He isn’t using the same $1.80 HDMI cable (really, it’s that cheap) that we mere mortals tend to buy. Oh ya, and did I say it only seats 3? 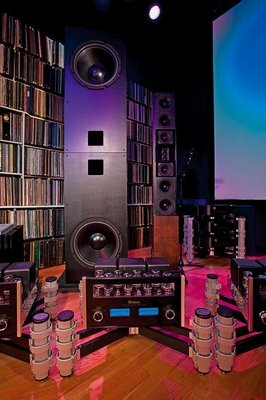 Man, I would love to listen to something like this or this on that stereo system ! Why waste that much when you could buy a 60k Watt rig?? Funktion one, Opus etc what a waste of money! What a total nut case. 6 million lmao waste of money and his, standards are so laughable. He brags about THX on and off like a broken record. He doesn’t have any THX baffle wall in place. 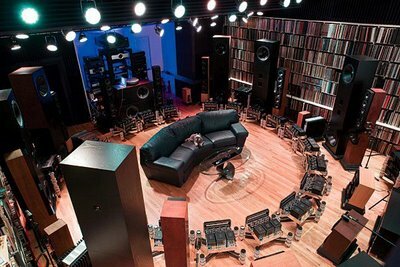 All the speakers for his standard are laying on the floor in total clutter of a mess and its the most untidiest 6 million laughable dollar home theater rooms I have ever seen. Snell THX Reference towers are by far the greatest speakers in the world with flawless sound quality and perfect audio fidelity, they were specifically chosen by J.R. Kipnis to achieve aural nirvana no other room in the planet could achieve. For unrivalled sonic performance, the only way to go is with an ultimate Snell THX Reference surround! Snell THX Reference towers are by far the grethatest in the world with flawless sound quality and perfect audio fidelity which is why the KSS is the best cinema on earth,there isn’t a speaker system on the planet that can compare to the unrivalled sonic performance of the ultimate Snell THX Reference!